Approximately three months of field classes in the UK and continental Europe and independent field mapping projects in Scotland, Southern France and Spain, with financial support from the department. The programme is fully accredited by the Geological Society of London. This programme is accredited by the Geological Society. Undergraduate students may join the Geological Society as a Candidate Fellow and can become a Fellow of the Society upon graduation. A Fellow of the Society with relevant postgraduate experience in the practice of geology has the opportunity to apply for Chartered Geologist (CGeol) status. 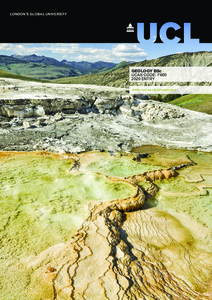 Together with subject-specific skills, the Geology BSc programme provides a strong intellectual and practical platform for those who wish to pursue non-geological careers as it integrates a wide range of ideas from many different scientific disciplines, including chemistry, physics and biology, and provides training in the application of scientific methods and knowledge to complex problems. The programme includes: studies of the nature of rocks and minerals, their mode of origin and environment of formation; the study of past life and palaeoenvironments; the physics and chemistry of the Earth; major Earth processes such as plate tectonics and mountain building (tectonics). During fieldwork students learn to apply and develop independent and team skills and problem-solving abilities which complement and build upon lectures and laboratory-based coursework, whist being exposed to the true complexity of natural geological systems. The BSc programme is identical to the first three years of the MSci programme. Detailed course descriptions are available on the department website: Geology BSc. The programme provides a broad education in geology, integrating field and laboratory skills with theoretical studies. The strong emphasis on fieldwork provides a unique opportunity to develop independent and team skills, problem-solving abilities and specific skills such as rock identification, fabric recognition, map-making and the geometrical solving of complex three-dimensional structures. In addition to further study, main employment destinations include: exploration and production for mining, oil and engineering companies, groundwater resources management; investigating ground conditions associated with land use, such as planning, construction and waste disposal; geological surveying, and collecting geological information for maps and databases. We normally reach a decision on making an offer on the basis of the application alone. If you are resident in the UK and have been made an offer you will be invited to a Post Offer Open Day. This visit will include introductory talks on UCL Earth Sciences and our degree programmes, a tour of the department and UCL and a question and answer session.